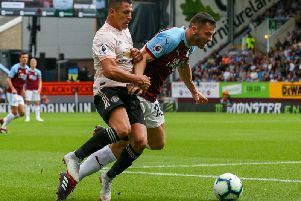 Jack Cork doesn’t want to waste the opportunity of a lifetime when the Clarets get a crack at European football for the first time in over half a century. Burnley earned a spot in this season’s Europa League by recording the club’s best finish since 1974, finishing seventh in the Premier League. The midfielder isn’t overlooking third qualifying round opponents Aberdeen, who they take on in the first leg at Pittodrie on July 26th. But he believes that reaching the group stages would be a marker of success: “The focus is on the European games, to try and get a few wins in that and try to get to the group stage. That would probably be a big target. “We have given ourselves the opportunity and I think it would be a shame to waste it. “We just have to focus on the Aberdeen game first. Should the Clarets get that far they’d face a minimum 12 extra games next term, with six of those ties in the qualifying phase played before August has expired. The England international was one of only five outfield players across the top flight to play every minute in the Premier League, and he’s welcoming another hectic campaign. “Hopefully it will be busy,” said Cork. “We’d like to get as far in the European competition as possible. “It will be a bit strange maybe being a few games into the season before actually starting the (Premier League) season so it will be interesting to see how everyone deals with that. And Cork confirmed that the squad won’t be losing perspective.